For the Sonic Mania version of this stage, see Metallic Madness Zone (Sonic Mania). For the similarly-named Sonic Heroes boss, see Metal Madness. Metallic Madness is the seventh and final round of Sonic CD. It is an enormous factory, seeming to go on for miles. Badniks with razor blades and swinging spike balls attempt to slow down your progress — permanently. Can you get to Eggman quickly enough and defeat him once and for all? 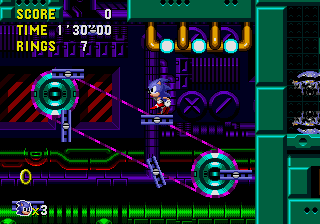 This is the only Sonic level in existence that has a Shrink-Ray gimmick, where Sonic must be miniturized to squeeze through a small maze in Zone 2. A dark and strange place makes the perfect habitat for everyone's least favorite Doctor. Many traps are present and Sonic will need to give it his all here. ...this happens. Robotnik is careless, as evidenced by letting his base become dark and corroded. Rusted structures with dim lighting are littered with outdated traps. Coupled with the onslaught of badniks, this is one future you don't want to come true. This can be avoided however. In this bright future, the clear skies let light shine in upon the round, and even plants can be seen growing about. With Robotnik's corruption gone from Little Planet, the future is bright for all its animal inhabitants! This page was last edited on 28 July 2018, at 20:38.